Mid-Century Modern...so hot right now. The clean lines, the floor to ceiling windows, the asymmetrical profiles...what's not to love? It's easy to picture the perfect family playing in the yard or Don the Drapes sipping a cocktail on the patio. I've always wanted to do one of those Palm Springs mid-century house tours (but Palm Springs is so far away!) 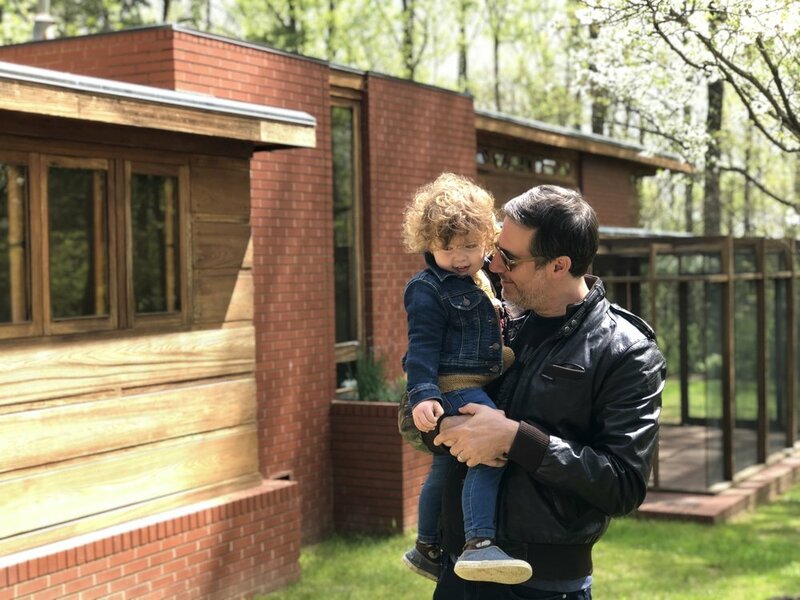 so when our friend told us about an annual midcentury house tour of her childhood neighborhood, Hollin Hills, just outside D.C. (only a weekend road trip away), we jumped! Hollin Hills is an incredible neighborhood with 450 Midcentury Modern homes beautifully nestled amongst the trees. It was designed in the 1940s by architect Charles Goodman along with landscape architect Dan Kiley. The land itself is hilly with streams running through it which Goodman and Kiley thoughtfully incorporated into the neighborhood's design (for example, the houses were all built on angles so that when you are looking out the expansive windows, you see the woods as opposed to your neighbors house.) But what struck me most about the neighborhood were the houses themselves. There isn't a dud in the bunch! Every single one was modern, unique, and stunning with interesting features and midcentury detail. The tour itself was well organized with 12 houses you can explore at your own pace (it's not a guided tour, you can float in between the houses anytime between the hours of 12:00-6:00). There are docents at each of the houses who can answer any questions you may have, tell you about the history of the house, or point out what was original versus any renovations. In addition to the houses on the official tour, there were also a few open houses for sale in the neighborhood too (which I'm sure was no accident). Consider yourself warned! I absolutely fell in love with one and quickly fell down the rabbit hole of fantasizing about selling our apartment in Brooklyn and making the move down to Virginia. Your probably asking yourself right about now... wait, you did a 12-home house tour with a toddler?? Are you nuts?? Truth be told, it wasn't that easy and might be more fun leaving the kiddos at home. Sally was pretty well behaved and she was able to run around some of the house's yards and walk between homes, but inside we did have to carry her to keep her from tearing around someone's house touching everything in sight. But it wan't terrible. While you are in the architecture zone, DO NOT miss out on touring another Alexandria gem – Frank Lloyd Wright's Pope-Leighey House. This two-bedroom middle class home was designed by FLW in 1939 and originally built in Falls Church, Virginia. So why isn't in Falls Church any more? Turns out, the house was right in the path of the proposed Route 66, so rather than tearing it down, the owners donated it to the National Trust and moved to its current location. For $15 you can now tour the home with a knowledgeable guide who walks you through the home while offering insight into what it took to have a family home designed by Frank Lloyd Wright (basically a whole lot of sucking up which including asking permission for everything from adding a door to the kitchen to picking out drapes). The home is truly unique though with stunning wood carvings, built-in bookshelves (complete with the original owners collection of books), and touches of his FLW's signature favorite color, Cherokee Red. After the FLW tour, we headed to historic Old Town Alexandria for brunch and a look around. The quaint downtown is right on the Potomac River. The highlights are an old torpedo factory by the water that now houses artists studios and galleries, a free trolley that will take you up and down King Street (which is a dream come true for any toddler Daniel Tiger fan), and a river cruise on the Potomic (we didn't do it but it looked fun!) The stores themselves in the town weren't all that amazing, but the row houses did have plenty of old world charm that reminded me of nearby Georgetown. Overall, a nice stop but maybe not a must-see.